Kyoto City Bus & Subway Information Guide:How to Take the Subway. 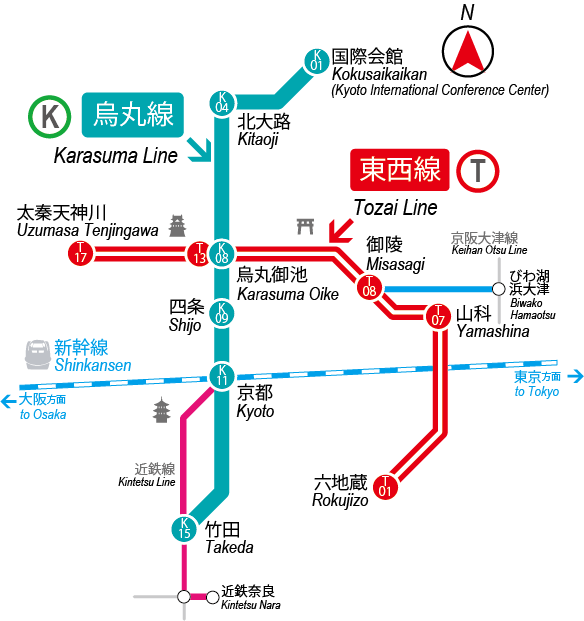 Both Lines share the Karasuma Oike Station ( ・ ). Transfering between the 2 lines is possible at this station. We operate generally from 5 o'clock to 23 o'clock. In the early morning and at night, the number of operation trains will be smaller. Please check the timetable for details. Fare is determined by the distance and stations traveled. Please purchase a ticket before getting on the train. You can use the following type of tickets. Credit & Debit cards cannot be used. JAPAN RAIL PASS cannot be used. Click a number to proceed.